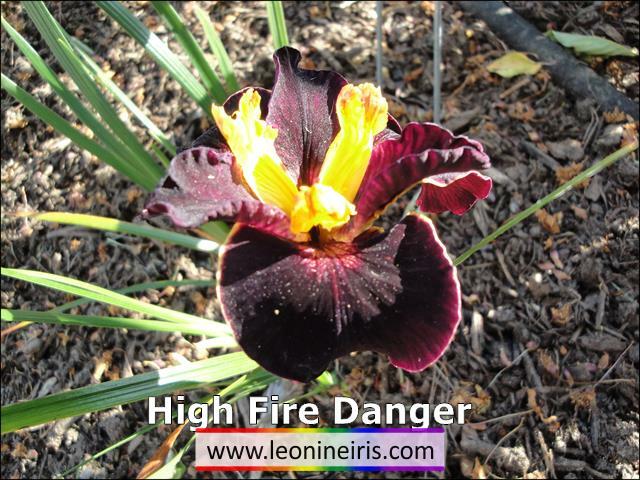 'High Fire Danger' (Joseph Ghio, R. 2011) Seedling #KP-160Y. CA, 12 (30 cm). Early midseason bloom. Standards and falls black; style arms deep yellow; faint ruby signal. Seedling #HP-143-2, 'War Zone' sibling X seedling #IP-114F: (seedling #GP-368F3: ( 'Now Showing' x seedling #EP-226T, 'New Blood' sibling) x seedling #EP-242bo: ( 'Star Of Wonder' x seedling #CP81-I2: ( 'Different Strokes' x 'Magic Carpet Ride'))). Bay View 2011.